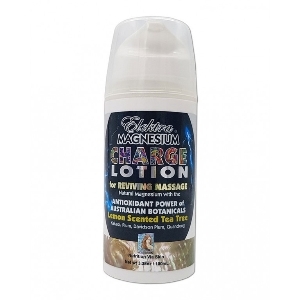 ELEKTRA MAGNESIUM CHARGE LOTION - For reviving massage. Natural magnesium with the antioxidant power of Australian botanicals: Lemon Scented Tea Tree, Kakadu Plum, Davidson Plum and Quandong. The Elektra Magnesium Lotion ‘Charge' is a hybrid 30% formula* half way between Magnesium Cream and Magnesium Oil Spritz designed for convenience as an all-in-one moisturiser, massage lotion, deodorant and magnesium supplement. This lotion is an astringent and suitable for those with skin types that need less fat but more magnesium (teenagers and adults). The texture is silky smooth, light and quickly absorbed and incorporated beautifully into the epidermis leaving behind no sticky residue. Hyaluronic Acid plumps up this lotion with hydration, and powerful antioxidant Australian botanical extracts of Kakadu Plum, Davidson Plum and Quandong add extra cleansing and collagen support. Lemon-scented Tea Tree gives the lotion a fresh aroma of tangy lemon whilst adding anti-microbial and antiseptic benefits. Please note that if using on face, those with sensitive skin may find it tingles temporarily before full absorption. If you have shaved prior to application then stinging may occur.